We have had the sacred privilege of leading discipleship trainings and mobilization workshops focusing on making disciples since July 2012. We have met with both North American and International pastors, staff, church leaders, and mission leaders. We have recorded some of their responses below as proof of how God has been awakening His people regarding this primary mandate of Jesus to make disciples. The purpose of this page is to provide you with firsthand reflections from a wide variety of participants on what you might expect by attending our trainings and how God has used this training to bring about a genuine transformation among our attendees. ​You might also share these testimonies as a way to communicate to potential participants just what God has done in the past through these discipleship trainings. We are truly humbled at how God has worked in and through these experiences to impact changes in churches and leaders all over the world. 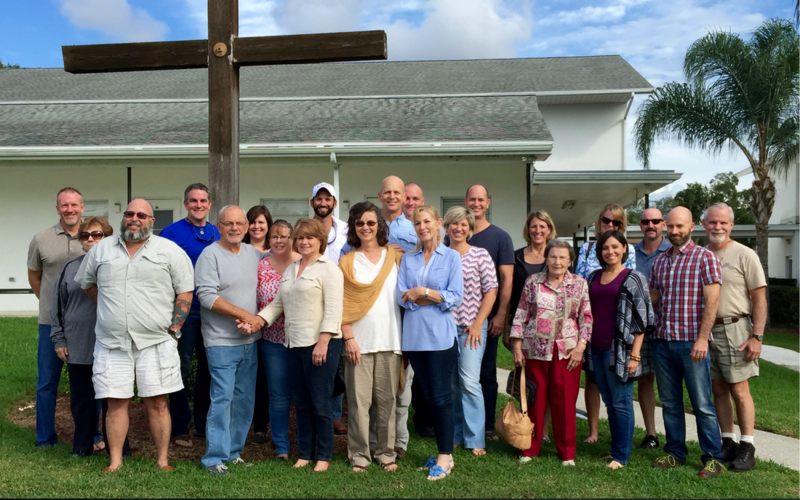 "This past weekend we hosted Denny & Cindy Heiberg. I invited them to do a weekend on discipleship. I wanted to drop you a quick note to let you know that it was an excellent weekend and the Heiberg's did an excellent job in casting a vision for making disciples. This aspect of the Mission Society is building the church and I do hope it spreads, especially among churches in the US who need this so desperately." "I can't begin to express my gratitude for you and Cindy. The time you spent with us on Friday and Saturday was incredible. As I stated on Saturday before I left, if nothing else, participants got to experience some great Bible study. However, having conversations with almost everyone, it was so much more significant than that. For some, it was the "kick" they needed and for others is was fanning their flames. So, thank you again." "Thanks again for all of your investment in us and our churches this week. I have already had several people say they can't wait for you guys to come back in September. I think God really used you all to move the needle in our church ( and certainly in our own lives). You're rockstars. Keep up the good work." Dr. Denny and Cindy Heiberg came to Saraland UMC, a church in southern Alabama with a Sunday attendance of 200, to teach about discipleship. 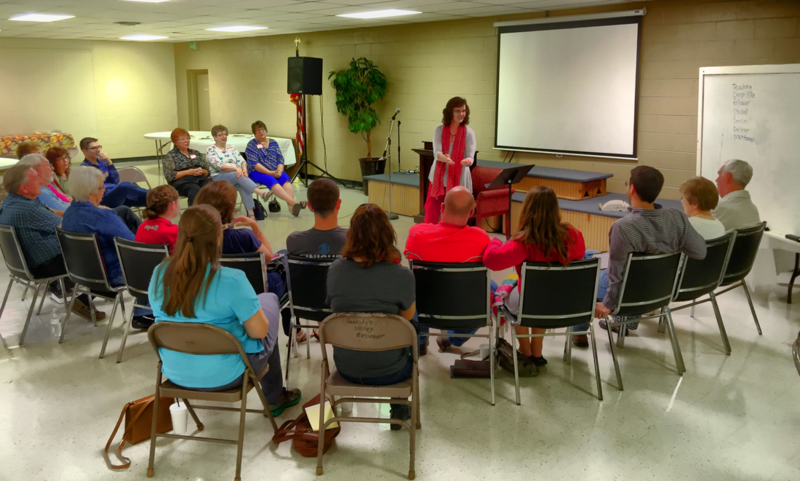 Their six teaching sessions and Sunday sermon had a strong impact upon our attendants. I saw two primary outcomes of this experience. First, it was exciting for me, as the pastor, to see excitement in others. Several of our older members, who had wondered whether their days of effectiveness were over, felt a renewed sense of personal calling. Several of our younger members felt, for the first time, the need to be proactive as leaders in disciple-making. Personally, I was reminded of the problem that “doing” the busy activities of church can sometimes distract us from the purpose of the church—to make disciples. Second, the sessions caused us to ask many questions about our church’s effectiveness. The Heibergs did not sell us a boxed kit with everything that we need to do as a church. Instead, they purposely posed difficult questions that helped us to ask what a discipleship culture might look like in our ministry setting. Our smaller group sessions, most of which were 10-15 people, gave us opportunities to share, reflect, and discuss the practical implications in our specific context. For example, we discovered together that our church was not as inviting to guests as we wish we could be. We realized that our younger families find it difficult to connect in fellowship and study. We also saw clearly that our culture has a consumer mindset, where most members are content to receive but aren’t necessarily growing as disciples. As a pastor, I might have taught these concepts previously, but it helped for our leaders to ‘discover’ these concerns for themselves during the discussions. There were two primary discipleship tools that the Heibergs taught, including the inductive Discovery Bible Study method and storytelling. Both of these methods are very helpful discipleship methods that we felt anyone could use, even if someone feels they have a limited understanding of scripture. The Heibergs are both strong communicators and have many years of experience in the local church setting. They are biblically centered and they ‘get’ the heart of the church is to make disciples. I was particularly impressed with their tendency to connect with individuals before and after sessions. People tended to open up to them about personal concerns in their lives, and that one-on-one mentoring was as helpful as the teaching times. If I could change one thing, I would wish for more church members to have accepted our invitation to attend the sessions so that more people would have the same profound experiences. We are hoping now that these concepts will begin to trickle throughout our congregation. Overall, I do not hesitate to recommend this experience to other churches and ministries who want to inspire their churches back to their biblical purpose—to make disciples. "The discipleship lessons have been very helpful to me and I am sure my life will never be the same again in my mission field. Discipleship is more than going through some Bible verses, but a relationship with a disciple. The Kenyan church lacks discipleship and if done, it’s not effective or done with a motive to bring common people together (birds of the same feathers). I now understand that in discipleship, potential and ability are discovered and nurtured and the disciples’ lives are transformed. They are made to focus and trust in God. The discipler fears the disciple can and will take over and gain favor from the others (congregation). The discipler is concerned on what will come from the disciple (personal gain) more than taking the disciple to Christ. The discipler wants the disciple to be like him – clothes, lifestyle, talking - rather than becoming or conforming to Christ’s image. The discipler looks down on the disciple as an inferior and demands respect and it is more of a coach/player relationship. I now understand we are all disciples of our great Rabbi Jesus and the discipler should let the disciple understand that he is still learning from Rabbi Jesus. It’s a lifelong, ongoing process. God bless you for your powerful teachings." 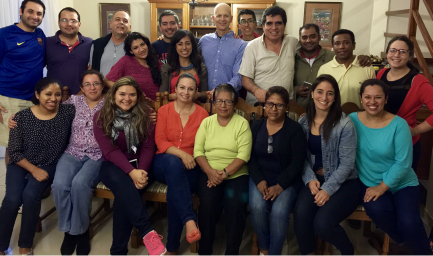 “Your discipleship studies have helped me very much in deed. Thank you very much Denny. My ministry is growing and now four great men in our church are going through the studies we went through in Nakuru. I am seeing the growth and I am praying for God to lead me through the studies and fulfill 2nd Timothy 2:2. I am praying for you and your ministry. I am expecting more from you. “The discipleship class has really changed my perspective on how to relate and live as disciples rather than master teacher and the disciple. Since 2002 together with my wife we have been working as missionaries to various parts in our country and I had also opportunities to visit our neighboring countries where I have been involved on training church leaders on Muslim evangelism and convert care both on spiritual and physical needs. This involves discipleship and your approach has really encouraged me. It is easy to follow and interactive which can make Bible study more lively. "May the grace and mercy from God the father our Lord Jesus Christ be with you. Much greetings from your student in Kenya. Thank you for your teachings of discipleship. I have put it to practice and witnessed the results." “Brother, Denny, I have much to say about the impact of your teaching in my life and the ministry. When you were teaching I discovered that I did not invest in Discipleship. This is a reason why all our evangelistic efforts were in vain. Let me tell you a typical example: last year 2012, I mobilized the whole church to do evangelism; door-to-door, person-to-person, and also mass evangelism. From January to December we got 104 people, but we did not focus on discipleship teaching but on the preaching only. Today I am telling you, we only remain with few people others went back to sin others are not effective. So, when you were teaching I remembered so many things. Can you imagine if I had those teachings, now the church could be multiplied? Please know how very important your materials are to me. “I am so grateful to God for bringing you my way in the course of ministry. Thank you for allowing God use you in inspiring us. The training in Nakuru was one of the most inspiring in my life and also provided a platform for networking with ministers. The discipleship classes gave me a different perspective on ministry, which I have started implementing in the church. We are in the process of forming small groups of about 5 to 7 members and I will be taking through the leaders of these groups a series of orientation on how to carry out the studies. The story you gave us about Rabbi Akiva has really inspired me. “It was such a privilege to participate in the training sessions. I learnt so much from the training and I am so grateful I came. I would like to say a big thank you to you. The session on discipleship on the book of John was awesome-quite literally. That insight on God's intentional revelation of Himself through Christ melted my heart-that God loves me so much that He went out of His way to intentionally show it. That made me love God all the more knowing He is not distant. “Indeed it's a great privilege for me to sit under your feet as we studied the truths of the word of God. I can confidently say the lessons learned and particularly about disciple making were very impacting. To say the truth, I've had to start all over again with our Bible study. For so long our Bible studies have taken the form of a Sunday service at the church where the preacher would expose the word. But thanks to the training we received, for the last three Wednesdays we are now walking through the word of God together with my members. I'm also looking afresh at how I can be more of a discipler of my people by creating more time to share with them on a personal level the important biblical principles while at the same time modeling the disciple's lifestyle, leading to more meaningful conversions. I had earlier shared with you how frustrated I have been about our evangelism and discipleship efforts, as they were not yielding much fruit commensurate to the responses for accepting Christ. Whereas I had been focusing on bringing in so many at one go, the retention rate was very low. Now I'm not in a hurry to have someone make a decision for Christ until I'm so sure they understand what it means to accept Jesus in their lives, which stems from a long hard walk with them as we open the scriptures, share and explain them in context. Once again, I want to say thank you for being a vessel in the Potter's hands so as to deliver to us these wonderful lessons. I'm going to go through each of these lessons with a keen mind to mine every detail that can help make a difference in the lives of the people God has given me so that I do not end up a workman needing to be ashamed, incorrectly dividing the word of truth. I desire to be found worthy in the eyes of the Lord to handle the awesome gospel delivered and entrusted in my hands for the benefit of his people for whom he has laid down his life. “Thanks for the notes on Discipleship. They proved to be helpful in sharing with ten church leaders in charge of discipleship in an Anglican congregation of about 3000 in a town called Embu located 130 km from Nairobi. The leaders are now encouraged and are daring to run with the understanding that "the church can not grow without discipleship!"